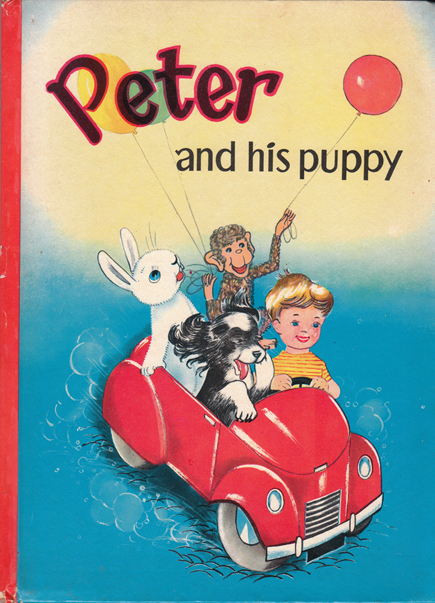 Description: A charming bedtime about Peter and Plucky the King Charles spaniel, and the adventures they have when Peter discovers a magic marble in his garden. Lovely, bright and colourful illustrations throughout – a number of which are full-page. Also includes a frontispiece, plus full-colour illustrations on the pastedowns and endpapers. Glazed pictorial boards. Upper corners bumped and worn; lower are largely straight. Spine bumped at both ends; slight damage on tail. Internally, the book is in very good order: all pages are clean, crisp, completely free from foxing, and are only lightly tanned. Original Dutch title: Peter en Puk. Measures 27.5 cm × 20 cm (11″ × 8″). 4to. Unpaginated.